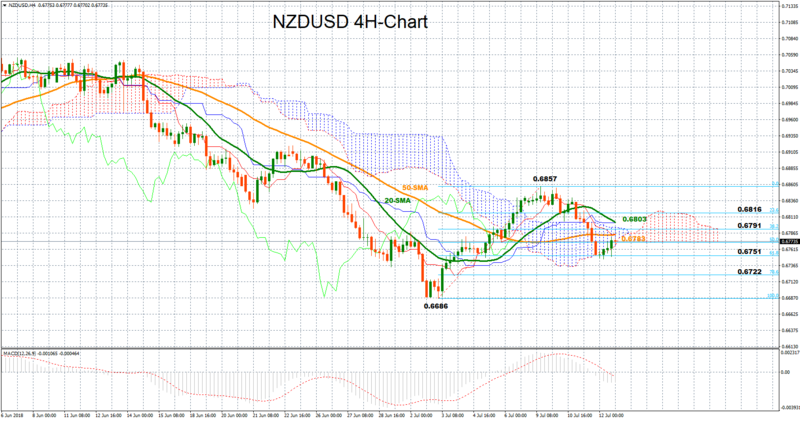 NZDUSD bounced higher once it printed a doji candle in the four-hour chart today, though the MACD points that risks remain to the downside as the indicator continues to expand in negative territory and below its red signal line. The red Tenkan-sen line sends bearish signals as well, distancing itself to the downside from the blue Kijun-sen line. A leg up could immediately visit the area formed by the 50-period simple moving average at 0.6783 and the 38.2% Fibonacci retracement of 0.6791 of the upleg from 0.6686 to 0.6857. A little bit higher and above the 20-period MA (0.6803), the focus could turn to the 23.6% Fibonacci of 0.6816 before the bulls potentially take the market up to the 0.6857 peak. Should this be broken as well, then the bullish sentiment would be reinstated into the market. Alternatively, a reversal to the downside could retest the 61.8% Fibonacci of 0.6751 which has provided some support during the past two weeks, while steeper declines could send the price well below the Ichimoku cloud, opening the door for a test of the 78.6% fibo of 0.6722.